Looking at Garrett Oliver now, it’s hard to imagine him as a young eccentric stalking the bars of Manhattan in the 1980s with black, knee-high military boots, a French lieutenant’s coat draped over his shoulders, and a telescoping nightstick at the ready in his pocket. Today, Oliver dresses classically and sharply: navy blazers, bold plaid shirts, medium-wale corduroy pants. The brewmaster, or head brewer, at the Brooklyn Brewery—a craft beer brewery in Williamsburg, Brooklyn—is a refined aesthete who speaks with a bombastic flair, often about his disdain for processed food. At lunchtime, when Oliver goes to his office’s kitchen to “throw a quick sandwich together,” he doesn’t come back with ham and cheese on sliced bread. Instead, it’s prosciutto and sheep’s milk ricotta on an artisan baguette. “Budweiser, Wonder Bread, Kraft slices—they aren’t supposed to taste good, they are supposed to wash down potato chips, keep your meat from falling on the floor, or be yellow and melt in an innocuous fashion,” Oliver says. In his 26 years of brewing, Oliver has invented new beer styles, as well as lectured in the United States and abroad on traditional brewing techniques. He has authored two books about the beverage and is editor-in-chief of the forthcoming Oxford Companion to Beer. At the moment, on 11th Street in Williamsburg, he’s overseeing an expansion of the Brooklyn Brewery that will double the company’s production capacity. Garrett Oliver discovered craft beer in England. In 1983, after he finished an undergraduate degree in film at Boston University, he secured a gig as a stage-manager at the University of London’s Student Union. He left the U.S. for almost two years to work at the venue, which hosted such acclaimed musicians as Billy Bragg and the Cocteau Twins, and during that time developed a taste for the cask-conditioned ales that typify the old city’s street-corner pubs. When he got back to the States, he found the domestic beer completely flavorless by comparison. So he decided to start brewing his own. Beer is a strange thing. It’s prepared by boiling germinated seeds with the flower of a marijuana relative, cooling, and then allowing the entire broth to be infected by microscopic mushrooms for about a month. The seeds generally come from barley plants, the cannabis cousin is called the hop, and the small fungi—yeast—create carbon dioxide and ethanol, which is why beer is fizzy and can get you into trouble. The range of beverage styles that this bizarre sequence of events can produce—from the dry citrus tingle of Sierra Nevada Pale Ale to the inviting smoothness of Guinness Irish Stout—is astounding. To realize these styles is an art. But it’s also a biochemical process. And unlike winemaking, which allows the grapes to do all the talking, brewing beer is often about deliberately manipulating natural ingredients to produce a target end product. Among the many flavors that Oliver has had in his head over the years are The Manhattan Special—a beer designed to taste like the espresso soda of the same name—and Black Chocolate Stout, which ultimately landed him the brewmaster position at Brooklyn Brewery in 1994. In the mid to late eighties, Oliver was a major player in New York’s budding craft beer scene, and all of his peers seem to remember two things about him from that time: his relentless self-promotion and his peculiar sense of style. “He would go around in these pirate boots and a cape,” recalls Peter LaFrance, a beer writer and old friend of Oliver’s. Mark Witty, former brewmaster of the Manhattan Brewery—the now defunct brewpub where Oliver first started brewing professionally—calls Oliver a one-off. He remembers a night in the eighties when Oliver had taken him to a party specifically to show him the host’s heat pipes, which had been decorated with gold leafing. “Garrett thought it was amazing,” he says with a chuckle. Oliver continued to excel, and when Witty left Manhattan in 1993, he took over as brewmaster. Within a year, however, internal problems arose at the company. Oliver didn’t waste any time planning his next move. 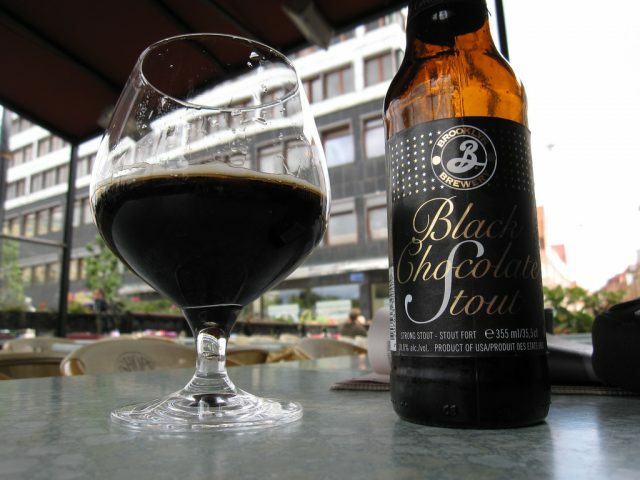 On July 4, 1994, while the Manhattan Brewery was closed for the holiday, he unlocked the doors and conducted a one-off experiment: the production of a rich, dark beer that he would call Black Chocolate Stout. He used the beer to court two entrepreneurs, Steve Hindy and Tom Potter, who were looking for a brewmaster to run the small beer factory they were building in Williamsburg. The gift was a convincing (and delicious) display of talent, and by the end of the year, Oliver was managing daily operations at the Brooklyn Brewery. Like many craft breweries, Brooklyn Brewery produces a series of limited production beers that are more experimental and stylized than their core lineup. It’s through these beers—known collectively at Brooklyn as the “Brewmaster’s Reserve”—that Oliver really gets to show his chops. To brew Intensified Coffee Stout, a Brewmaster’s Reserve ale released in the summer of 2009, Oliver used darkly roasted coffee beans from Stumptown Roasters in Red Hook, Brooklyn. Also in 2009, Oliver designed a Reserve ale collaboratively with Floyd Cardoz, executive chef at the New York City Indian-influenced restaurant Tabla. He and Cardoz selected a mix of Indian spices, roasted and ground at Tabla, to enliven a Belgian-style wheat beer. They called the result Cuvée de Cardoz.